The Second World War began for Canada on September 1, 1939. The British and its commonwealth declared war on Germany after they invaded Poland. Ralph Mayville was a young man at this time, and in need of money. His father had passed away and the responsibility lay on him to provide for his three sisters and mother. His first attempts at joining the Canadian armed forces failed due to his young age; however, in 1940 at the age of 17, Ralph Mayville became a member of the Essex Scottish, earning $1.10 per day. Becoming frustrated with delays and holding periods to enter the battle, he joined the Royal Canadian Forces headed for Italy; from there Mayville joined the First Special Service Force (FSSF) – a joint Canadian-American initiative – who were looking for replacement recruits. The FSSF operated from 1942 to 1945; the unit originally consisted of 1,800 Canadian and American soldiers, who were the elite of the elite, and it is no exaggeration to refer to them as super commandos. They were asked to do what no other unit was capable of doing and they performed their duties with distinction. In 1942, Mayville saw his first action on the Anzio Beach Head, where they fought for 99 days without relief. The FSSF did mostly night patrols, dressed all in black, and painting themselves and their weapons black. The Germans dubbed them the “Black Devils” and the name continued as the “Devils Brigade”. They would sneak into the German’s camp in the night and put stickers on the foreheads of the sleeping soldiers, which would read in German ‘the worst has yet to come’. Their mission was to break the morale of the German encampment. After breaking through at Anzio, the FSSF made their way to Rome, cleaning out small towns along the way. Having established a foothold in Rome, Mayville was sent to amphibious training in Santa Maria di Castelabate; this training had Mayville approaching a cliff in a small rubber boat and then scaling up the cliff. While the allied armies were preparing for the invasion of Southern France, the FSSF was tasked with taking two islands the night before and eradicating the German artillery there. Mayville and his group were on their way to the mountains bordering France and Italy as the allied forces were making their way to Germany. The FSSF was to ensure no reinforcements crossed the border in aid of the Germany. It was in the mountains at Mentone that Mayville was hit by shrapnel from a shell and lost some of his hearing. After the Axis powers surrendered, Mayville arrived home on October 1st 1945. Ralph Mayville was born on August 21, 1921 and raised in Amherstberg, Ontario; he now resides in Windsor. He married and had two children, four grandchildren, and numerous great-grandchildren. Mayville earned his paratrooper wings after making his first tandem parachute jump at the age of 92. He had not received parachute training before he saw action and wanted to earn his wings. Ralph Mayville has been honoured for his service both at home and internationally, receiving a U.S. Congressional Gold Medal on February 3, 2015 in honour of his battlefield heroics and sacrifices, and the French National Order of the Legion of Honour during a ceremony at the Major F.A. Tilston, VC, Armoury, on Saturday, February 6, 2016. The Essex Free Press. “Through the eyes on the devil.” November 5, 2008. Canada.com. 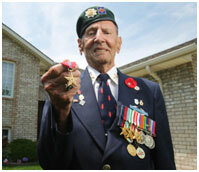 “Veterans of famed Canada-U.S. devils brigade to receive congressional gold medal”. July 2, 2013. Windsorstar.com. “Local veterans receive Frances highest honour for bravery.” February 7, 2016. LiberalSenateForum.ca. “First Special Service Force – Congressional Gold Medal.” February 5, 2015.